This post will deal with the stone tools found at Calico site, in the U.S. and the possibility that they were made by Homo erectus. Calico is located in the Mojave Desert of California, near the town of Barstow. The Calico site dates back to 1942, when some amateur archaeologists found some very primitive stone tools in the sediments of what once was Lake Manix. It is very likely that hominids (either modern humans or, as the Calico findings suggest, Homo erectus) would have lived, hunted, gathered food close to this lake during the “wet” periods shown above. The formal excavations began in 1964 with Ruth DeEtte Simpson and later, Louis B Leaky, a famous archaeologist who made some amazing discoveries at Olduvai Gorge in Tanzania, Africa. The stone tools (or, “Calico Lithic Industry”) found at the site have been dated to about 200,000 years ago. Which is long before the first modern humans H. sapiens appeared, and obviously long before they even ventured out of Africa and walked all the way to America. This dating matter has made “orthodox” archaeology dismiss the findings and class them as “geofacts” that is, naturally shaped stones instead of “artifacts” or man made tools. Calico’s controversial lithic industry has sparked many debates and the crude stone tools do indeed look antique and lack the beauty of the artfully crafted stone arrowheads, scrapers and tools made by Indians or Paleo Indians in more recent times (since 15,000 years ago). However, they are very similar to the stone tools made by H. erectus whose stone tools are classified as the “Acheulian lithic tradition” which first appeared in Eastern Africa about 1.6 to 1.4 Million years ago and expanded to Asia where it persisted until about 125 ka. The H. erecuts chose specific raw materials from which they would make their tools, they then prepared these cores and knocking them against an “anvil” stone to obtain bifacial pieces with sharp cutting edges. The flakes produced in the process were also used as cutters or scrapers. 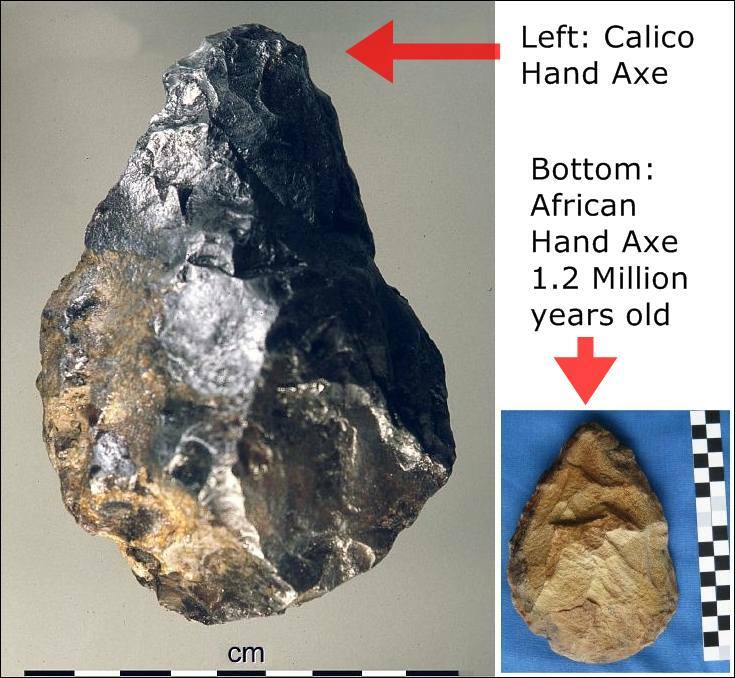 The image below shows a hand axe from Calico (left) , and one from Africa that was made by H. erectus 1.2 Million years ago . They are very similar, hard to tell apart. But not all believe that the stones are man-made ( and  uphold that they are artifacts made by humans). Others that they are natural . The natural origin theory says that stones originally broke off from the Calico Mountains due to weathering and flowing down their slopes, banged against others, chipped and flaked. Then subjected to the rolling of waves (Lake Manix), pressure against other stones, removal and redeposition, etc, got shaped even further and resemble man-made tools. Man made tools display delicate working and flaking while natural sources wear down the stone and round off sharp edges. This can be easily seen while walking by a stream: one does This means that geofacts are not so common. Why would there be so many of them at Calico? 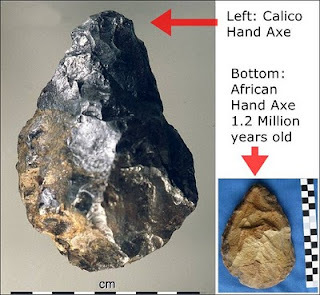 My personal opinion is that the stone tools they are very (see the photographs at the Calico site's official website) similar to those made by men in other parts of the world, and are definitively human, man made. Their age is also a clear indication that they were crafted by H. erectus. Nevertheless, and despite my own amateurish opinion, several scientific papers have been written on this subject and look into many factors such as the angle of the fractures in the stones, to decide if they are or not man made. The conclusions are mixed some opt for a natural origin others for artificial one. Further research my clarify the point. Digging continues at the site. Calico Early Man Site. The Calico Lithic Industry. Online. Christopher Hardaker, (2009). Calico Redux: Artifacts or Geofacts?. Earthmeasure Research SCA Proceedings, Volume 22, p. 18. Vance, Haynes, (1973). The Calico Site: Artifacts or Geofacts?Science 27 July 1973: Vol. 181 no. 4097 pp. 305-310. Image source. Anthro Tools: acheulian. they are clearly man-made. nature does not produce stones like that. Natural stones are often rounded by rolling in a river for thousands of years or even from being in an ocean at times. They are specifically chipped into arrowhead type shapes. Thanks for your comment. It is a pity that orthodox science does not support our point of view! Too bad science is burying almost as much evidence as they are excavating. If these tools were found in Africa no one would be saying nature made them. So there were people in America atleast 200,000 years ago. Figures. Like I always thought, Kennewick man is the tip of the ice berg. Calico site is simply “too old for America”, for the eyes of the mainstream of archaeology,... so I think it is expected to be denied for much longer, and by any possible form. One of the authors mentioned in your sources, Christopher Hardaker, has also published the “Calico Lithics Photographic Project”, where he analyzes relevant aspects, related to flaking and taphonomical considerations, that suggest that at least the shown lithics, could not have been made by nature in any way. - From the so called Denticulate Mousterian, a facies of the Mousterian present in some sites of Europe and Africa since MIS 7 (240 Ka), because of the high proportion of denticulates and notches in most of the material. But, what makes this assemblage somewhat enigmatic, and extremely interesting (at least for me), is the presence of blades...indicative that they applied some sort of laminar technology too... which sometimes may be considered as a sign (among others) of modern behaviour in humans. My opinion, as only an amateur in archaeology, is that they are real tools. Accordingly to the dated geological context, which seems to be undisputed, I agree with you that this site is likely to be inhabited by the last H. Erectus, coming from Asia via the Behring Strait. At this respect, the mean depth of this strait is about 37 m, so a minimum conservative sea level in the range of -50/-55 meters, would allow the terrestrial passing. In every Pleistocene climatic cycle, there has been several time windows (during the interstadial stages) in which this sea level requirement was complemented with the other needed requirement, a path reasonably free from ice. So H. Erectus could perfectly enter into America during a convenient stage, perhaps before the Illinoian (or Riss for europeans) glaciation (190- 130 Ka). Furthermore, if we consider that they could have had some skilling in navigation, as you suggested in other post, they could do the travel with even higher sea levels (chronologically closer to the previous interglacial period), with an inherently warmer climate, by “jumping into islands”. As the latter mentioned was the presumable way the first xenarthrans entered in North America via Panamá Strait in the Late Miocene, well before the land pass was fully consolidated,... why not consider similar possibility for humans through Behring Strait? It is right to say that this same reasoning could apply to H. Sapiens (or even archaic H. Sapiens) too, but only during the Wisconsin glaciation (85 – 11 Ka). Your site is really interesting.